The best moments in our lives, often, contain ice cream. Whether you run an ice cream shop, sell it from your convenience store, or have a buffet that offers a stellar selection of flavors, you sell happiness. The best commercial ice cream freezer will allow you to sell and store that happiness at the perfect temperature. What are Commercial Ice Cream Freezers? No matter if are looking for a dipping cabinet, or a chest freezer, or even a curved glass novelty display freezer, you want to know it's the best one. Your customers rely on you to provide great ice cream, and you rely on that freezer for not only perfect storage but also safekeeping your inventory. Here are some of the frequently asked questions about commercial ice cream freezers. Commercial ice cream freezers are bigger freezers than the average freezers. They are used for storing different flavors and types of ice cream in any type of business. There are so many varieties of ice cream freezers. These include ice cream chests, mobile ice cream display freezers, and novelty ice cream chests. There are even gelato dipping cabinets. 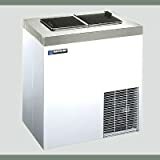 You can buy commercial ice cream freezers from Amazon, and eBay, as well as Webstaurantstore.com. The price range for a commercial ice cream freezer can vary between $600 to well over $2,000. It all depends on the brand, the size and the type of commercial ice cream freezer that you’re looking for. We reviewed each commercial ice cream freezer by looking at each freezer’s features, and prices, as well as the different styles. We also researched the different sizes of each ice cream freezer. Since there are many varieties of freezers, it takes some time to narrow choices down. Below are some varieties of the best commercial ice cream freezers. Choosing the right freezer for your needs means taking the use, shape, size, capacity and purpose into account. The Omcan 37815 79 Inch Commercial Curve Glass Novelty Ice Cream Freezer Chest is designed to increase sales of novelties and other ice creams for your business. This freezer features a built-in lock for security reasons, a plastic trim and door frames, as well as steel interior walls. It also features a rear defrost drain in case any water builds up. It comes with wire baskets as well as sliding glass doors with curved top glass for easy access for the customers and employees. This ice cream freezer ranges in prices from $1,000 to $2,000, so it is quite pricey. However, it may be worth it, if it helps your business gain more customers. It is available on Amazon. This ice cream freezer also comes with a manufacturer's warranty in two different parts. Part one is for the one-year parts and labor warranty, while the five-year warranty is for the compressor that comes with the freezer. Customers give this freezer a 5 out of 5-star review on Amazon. Many complimented its small size, saying that it fits in well with their business style. Some other customers also commented on the fact that they thought it was a well-priced freezer. There aren’t any negative reviews of this product. The Master-Bilt DC-4D Ice Cream Dipping Cabinet features a display that shows three 3-gallon tubs with storage for one tub underneath the display case. It also features a heavy gauge, high-grade steel exterior and interior shell with stainless steel flip-top lids. This dipping cabinet also features a bottom drain for easy defrosting. It is available for high prices ranging between $2,000 to $2,750. This freezer is available on amazon. Some customers give it a 4 out of 5-star rating and warn others not to move it around because the contents shift in the freezer. However, once it is in place every piece is fine. Some say that the lid for this freezer isn’t as great as other freezers they’ve had, but it still holds up well, even with years of use. 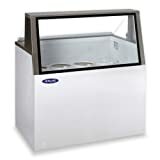 The Chef's Exclusive Commercial 8 Flavor Frost Free Ice Cream Dipping Cabinet - 14 Cubic Feet comes with features such as a wide range thermostat, interior LED lighting and a cold wall evaporator. It also comes with heat protected glass to prevent frost build up. Its design is to make the ice cream treats inside look more tempting to try. Prices are high for this commercial freezer and range from $1,000 to $2,000. This ice cream freezer is available on Amazon. Customers gave this product excellent reviews. A customer even said the freezer has a very attractive look and that it makes the toppings for the ice cream easy to display. The way the toppings are displayed make them look more tempting to put on each and every scoop of ice cream. Another customer said that they use the horizontal doors rather than the vertical doors. The doors make it easier to put multiple cups of ice cream on top of the freezer in order to put the toppings on. There are no negative reviews of this product. 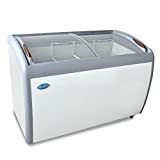 The Chef's Exclusive Commercial Frost Free Sub Zero Mobile Ice Cream Display Chest Freezer 7.5 Cubic Feet comes with features such as a one-piece lid locking frame design, and see-through glass in order to see the ice cream flavors easily. Everyone wants to be able to see which kind of ice cream is available to try at any store, so this freezer makes it easy for them. It holds six three-gallon tubs of ice cream. The temperature of this ice cream freezer has two settings including 5 degrees Fahrenheit all the way down to -15 degrees Fahrenheit. The prices for this ice cream freezer range from $700 to $900. It is available from amazon. Customers gave this ice cream freezer amazing reviews. The customer said the freezer arrived in perfect condition and in a timely manner. He said they use it for both storing and serving ice cream at their business. They also say that Amazon gave them the best price even after looking all over online for a good deal on an ice cream freezer. There are no negative reviews of this product. 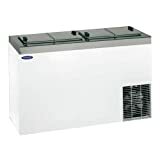 The Chef's Exclusive CE205 Commercial Frost Free Sub Zero Mobile Ice Cream Display Chest Freezer 14 Cubic Feet offers features such as heat reflective, single layer glass, a sliding door and a low-profile design for greater visibility. It can even fit six interior baskets full of ice cream inside it and it is available from Amazon. The prices for this ice cream freezer range from $900 to $1,100. Customers gave this freezer a 5 out of 5-star review on Amazon. Some customers love the fact that this freezer is small and very compact. They even said it was very convenient to have in a small ice cream parlor because it saves space and offers delicious treats. 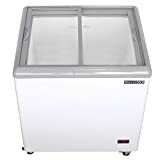 The Maxx Cold MXF31F 31” 7.5 cu ft Commercial Mobile Ice Cream Display Freezer offers features such as a one-piece frame lid design and a heat reflective glass lid. This freezer offers a temperature range of -5 degrees Fahrenheit to -15 degrees Fahrenheit. You can purchase it on Amazon. It is available for prices ranging from $900 to $1000. This freezer is given amazing ratings by customers on Amazon. They say that it's easy to scoop ice cream out of and it's easy to clean off. They also say that it is easy to defrost. There are no negative reviews of this product. The Excellence HFF-8HC 54 Inch Flip Lid Ice Cream Dipping Cabinet comes with 12 three-gallon containers, as well as heavy gauge, high-grade steel exterior and interior shells with stainless steel flip-top lids. There is a bottom drain that allows for easy defrosting of this ice cream freezer. It is available for purchase at Amazon. It is available for prices ranging between $8,000 to $8,500, so it is quite a pricey ice cream cabinet. Most customers had positive reviews of this freezer. One customer gave the freezer a 3 out of a 5-star review and said that it was a great buy for a great price. They also said it fits in well with their small dessert shop and ice cream parlor. They use it to serve ice cream and also to store hard ice cream. However, there is one negative review. One customer gave it a 1 out of a 5-star review. This customer warns others about this product by saying the freezer has been worked on by three different service companies and none of them have been able to figure out why no one can fix it. The last company that came to look at the freezer warned the customer that it couldn’t even be fixed. The customer warns people to save themselves the trouble of purchasing it and actually gave this freezer an F-minus rating. The Chef's Exclusive Commercial 12 Flavor Frost Free Ice Cream Dipping Cabinet features a way to serve mouthwatering gelato, sherbet and other mouthwatering desserts and treats. There is a stainless-steel finish. It is also designed to display up to 12 pans at once with additional storage underneath. This dipping cabinet is sure to keep up with the demands of any amount of high-volume customers. This freezer also comes with built-in LED lighting. It also features single layer heat reflective lids and the Mezzanine shelf can be used to raise the gelato to a comfortable scooping height for anyone working behind the counter. It is available from Amazon. This freezer also has a temperature gauge that ranges from -15 Fahrenheit to 40 degrees Fahrenheit. It is available for prices ranging from $2,000-$3,000, so it is one of the most expensive freezers. Customers gave this gelato dipping cabinet a 5 out of 5-star review on Amazon. They say the price of the product is worth it for their business. They also said it is very easy to clean. Although, it isn't a no frost freezer and that made some people reduce the rating from a 5 out of 5 review to a 3 out of 5-star rating review. There are no other negative reviews of this product. The Nor-Lake HF100-WWG/0L Nova 48" Low Glass Ice Cream Dipping Cabinet includes a display that offers customers the chance to see flavors of ice cream in eight 3-gallon tubs at a time. This dipping cabinet also features six additional storage tubs for fast ice cream change outs. It also has a temperature between -9 and 7 degrees Fahrenheit. Temperature is another feature that is easy to adjust with this freezer. Prices for this product range between $4,500 to $5,000, so it is a very pricey freezer. It is available on Amazon. This product has gotten great ratings. Some customers said that it is very easy to clean, and the seals stay tight even with the constant use. A lot of customers say that the temperature control is easy to adjust. There are no negative reviews of this product. 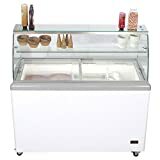 The Avantco ADC-8 Ice Cream Dipping Cabinet – 49 Inch offers features such as a white curved painted design with painted steel construction and a manual temperature control. This freezer holds temperatures between 0 and -13 degrees Fahrenheit, and it also has eight ice cream tubs which hold six gallons of ice cream each. The freezer is available from Amazon. It has even more storage underneath the display area for six back up tubs of ice cream in case you are ever in need of refills. It is available for the prices between $1,000 to $1,500. Customers gave this product great reviews. One customer loved that this freezer had organized shelves for each tub of ice cream in order to eliminate waste. She even said she uses the freezer for making frozen shakes and smoothies for her customers. There are no negative reviews of this product. We would pick the Omcan 27941 50-inch Ice Cream Display Freezer with 12.8 cu. ft Capacity because of the fact that this freezer has eight ice cream tubs that can be filled with up to six gallons of ice cream each. The fact that it can hold six more gallons of ice cream in case you are in need of refills, makes this freezer even more enticing to buy. Not many freezers can hold that much ice cream. The price is reasonable as well.